This Tacoma retrofit is painted in Toyota Cement Grey and Speedway Blue Metallic OEM paint job. We retrofitted a Morimoto D2S 5.0 Projectors into this set with Apollo 3 Shrouds and RGB Color Changing Demon Eyes. Simple yet effective retrofit we finished up for our client. 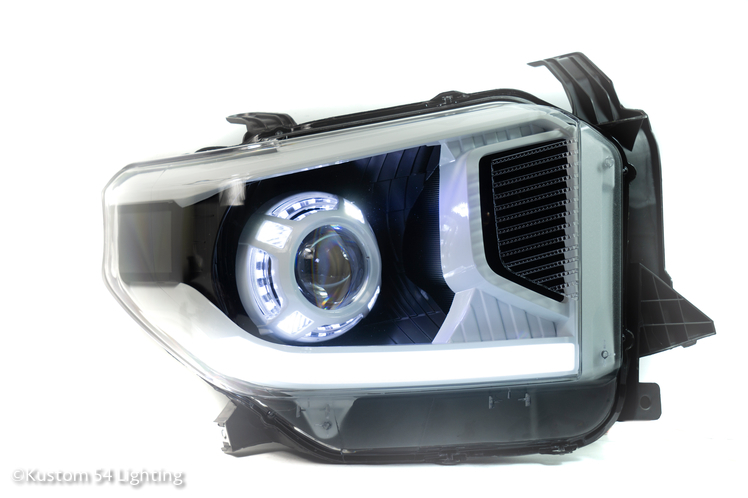 We paired this F150 headlights with the new and impressive Morimoto 5.0 bixenon projectors. The front bezel is OEM black and shroud and reflector was kept OEM chrome. 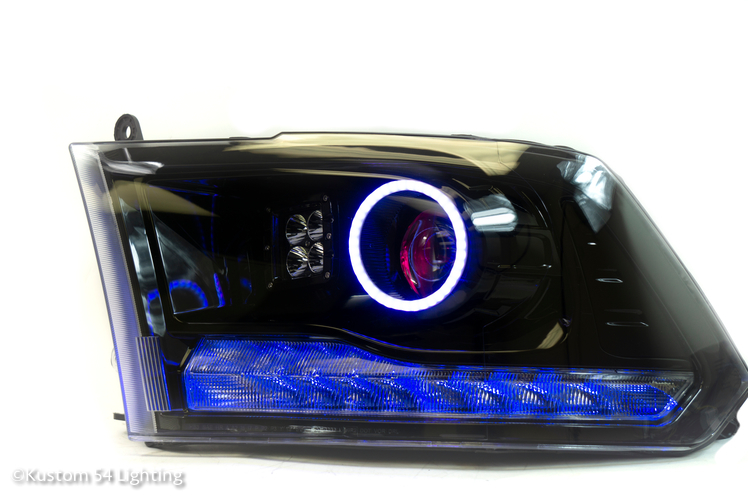 Going out to one of our clients is a full paint matched retrofit for 09-18 Dodge Ram with Morimoto D2S projectors etched with a Punisher symbol for a better lighting. We also ditched the amber reflector and replaced with a clear reflector. This gorgeous Tundra retrofit received Morimoto D2S 4.0 bixenon projectors paired with Panamera Switchback shrouds and color changing Demon Eyes. The entire housing was painted satin black for a stealthy look. 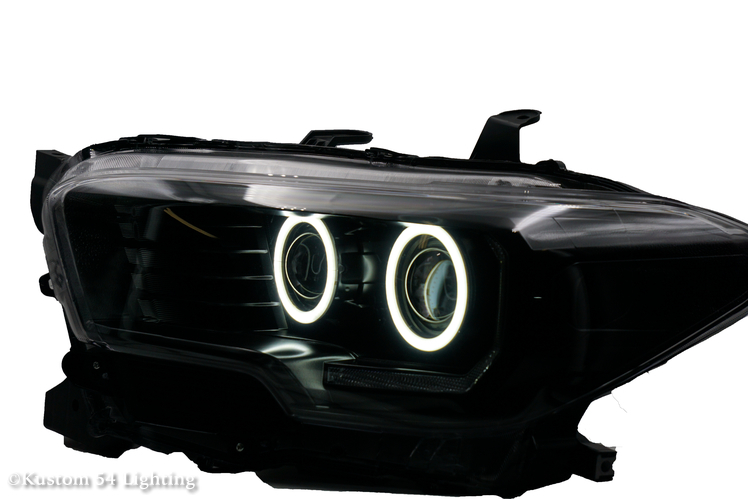 This set of Ram headlights are retrofitted with Morimoto D2S bixenon projectors and paired with Apollo 1 shrouds painted in satin black. The rest of the housing got a gloss black paint job and clear reflectors. 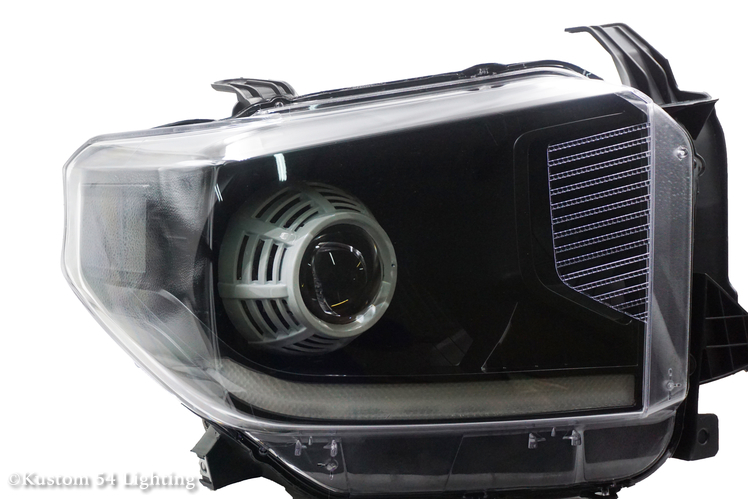 Heading to our client is a 07-14 Toyota FJ Cruiser we retrofitted with K54L D2S Projectors and Panamera switchback shrouds. We did a two tone paint job on these with satin back and OEM paint match. This Forester retrofit may look OEM but it is something special. This retrofit actually has JDM front bezel and lens along with Morimoto D2S projectors and E55 shrouds for max performance and OEM esthetics. The upper eye bro was also retrofitted with our switchback LED strips. 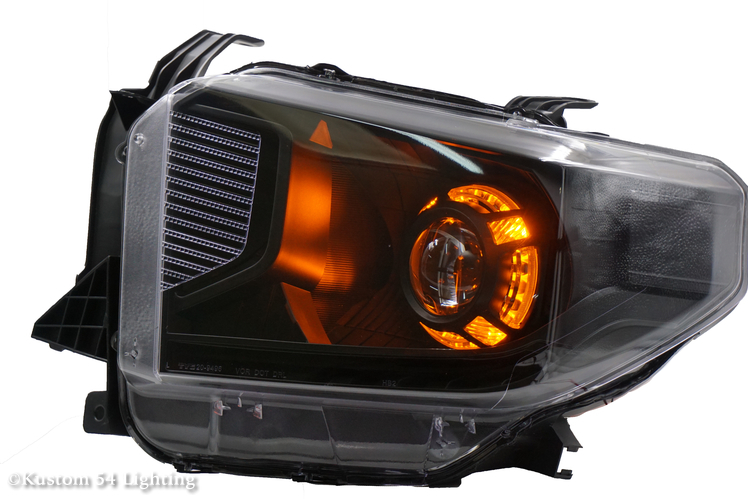 This custom set of Tacoma headlights that was retrofitted with Morimoto D2S projectors and painted in OEM two tone paint job. This set got Gatling Gun 2.0 Shrouds with an angry style front switchback halo. 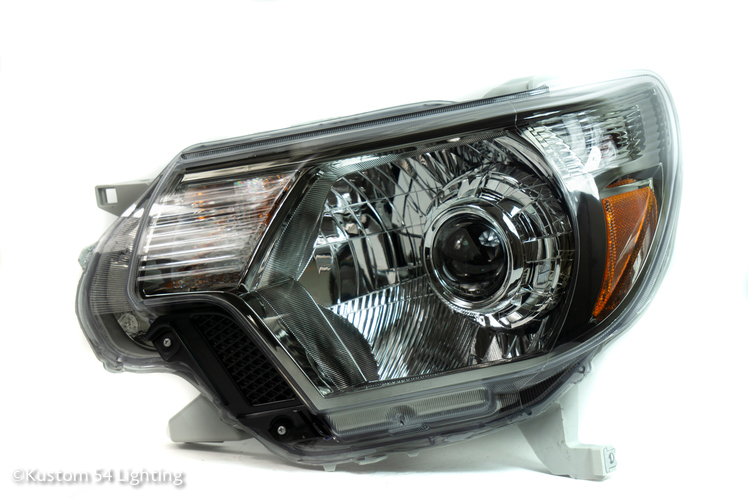 We did a little something different with this retrofit for the Toyota 4Runner. Our customer requested to fill up the original high beam area since he no longer needed it due to the BiLED Morimoto projector upgrade. We used our 2 inch pods to fill the space to act as an additional high beam for added output. 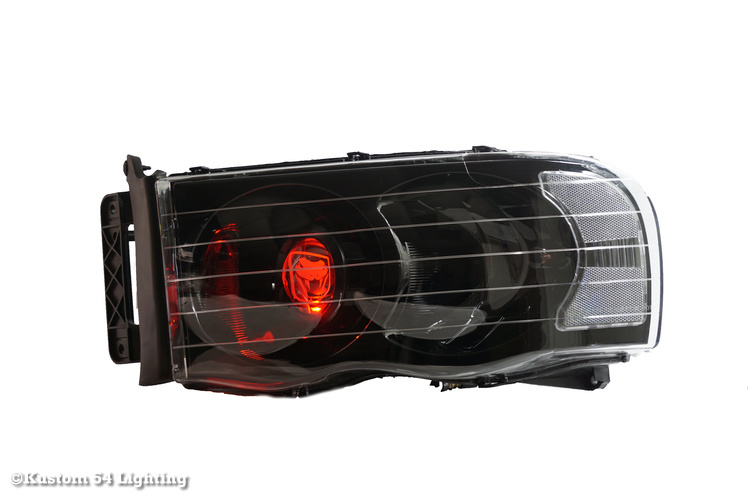 The headlight also received our switchback full halos and our lower sequential LED strip. This Tacoma retrofit is a full OEM style with a TRD touch. The front bezel has slight tint to the chrome to replicate the TRD look and the rest of the retrofit was left chrome. We added a Morimoto D2S projector for lighting performance paired with an Apollo 3 shroud. This 4Runner retrofit has our newest option which is a switchback top LED strip paired with our Half Switchback halos. The projector is of course upgraded to a Morimoto BiLED with custom etching and color changing demon eyes. This 4Runner retrofit came with our Morimoto BiLED projector with a full satin black paint job and paint to match amber reflector. 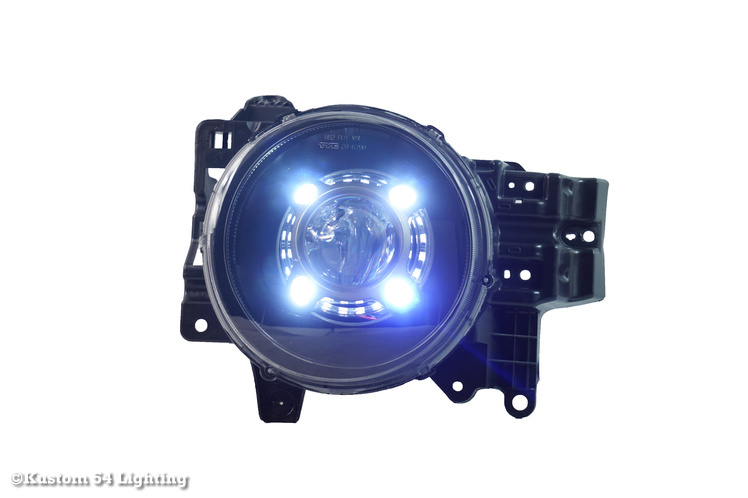 This set also comes with Color Changing Halos and Demon eyes along with our DRL sequential switchback strip. Check out this Tundra retrofit with OEM paint match and black accent paint job paired with Morimoto D2S 4.0 bixenon projectors. 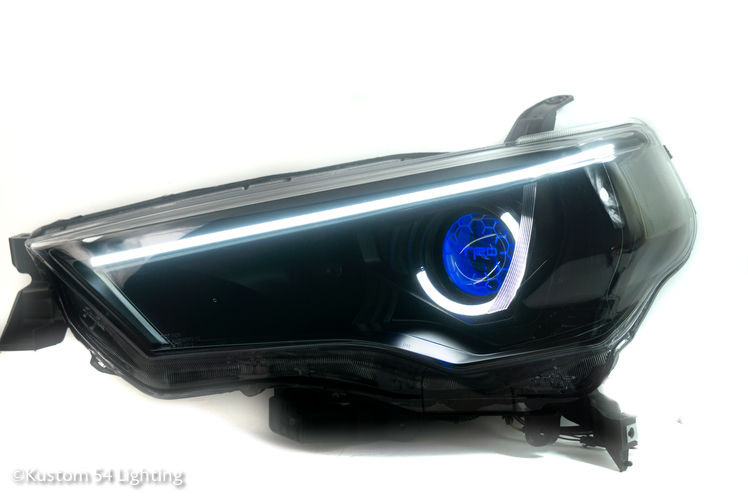 This set also includes our custom DRL paired with Panamera switch back shrouds to match. 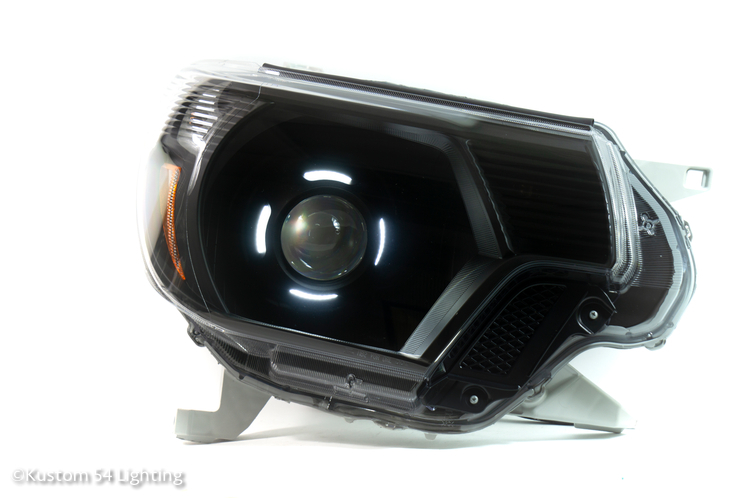 Going out the door is this custom set of Tacoma headlights that was retrofitted with Morimoto D2S projectors and painted in a full flat black paint job. This set got some Apollo 2 Shrouds and rear switchback halos. 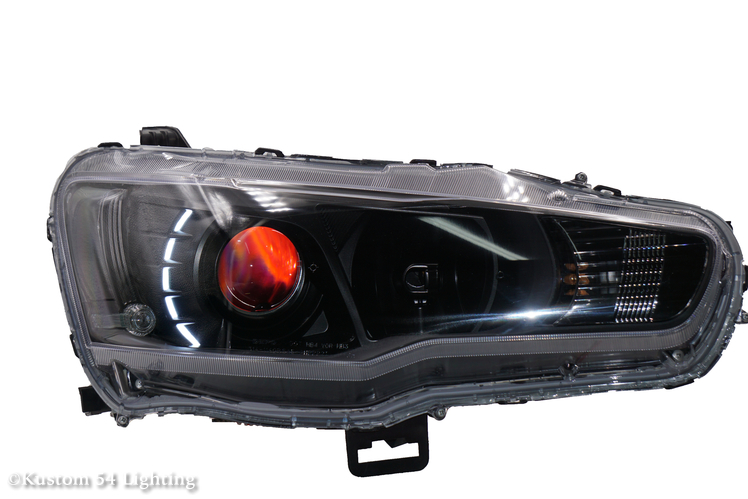 Heading back to Hawaii is a blacked out set of Tacoma headlights with our upgraded goodies. We ditched the OEM projector for an RX350 bixenon upgraded projector and blacked out the entire housing in satin black finish. We also added our halos to match the OEM DRL. This Silverado retrofit got our H1 Bixenon retrofit projectors paired with Gatling gun shrouds and an All Lights On Mod. 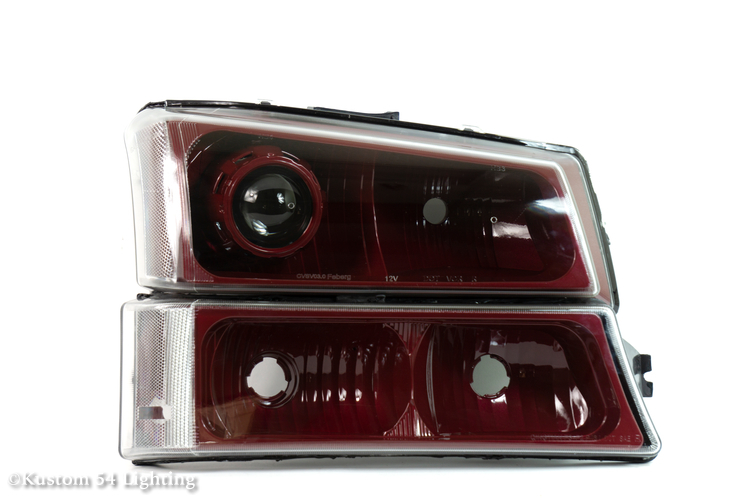 The entire housing including the running lights were painted Sport Red Metallic with a clear reflector option instead of the amber. Going to their new home is this 3 tone painted retrofit. 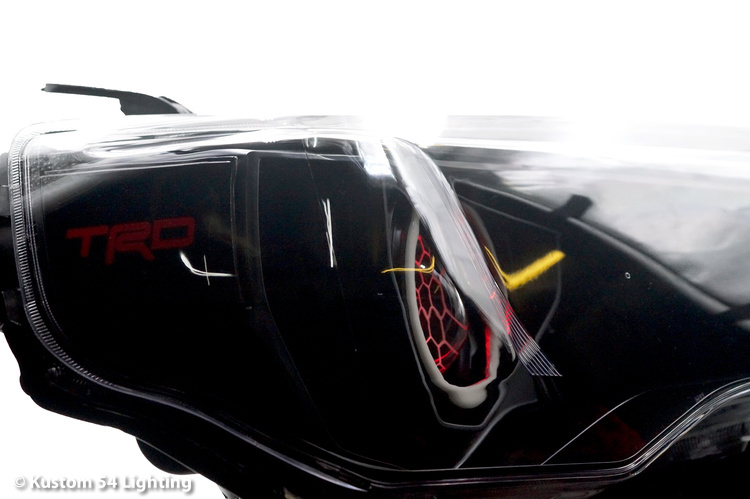 The projector we used is a Morimoto D2S 4.0 bixenon projectors paired with G37 shrouds. 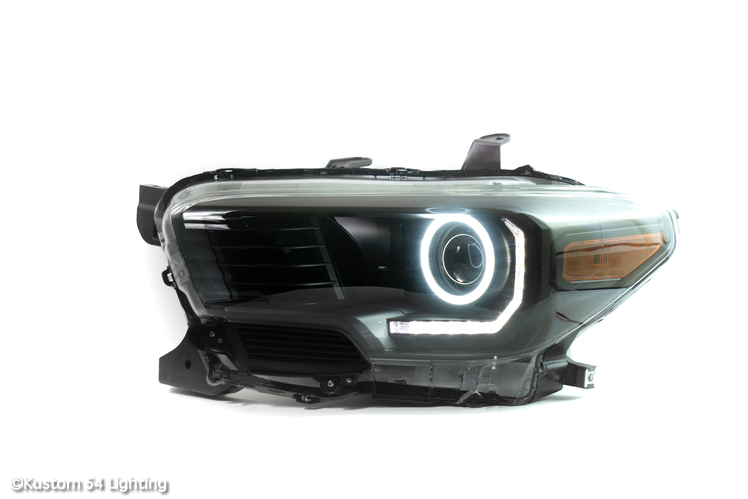 We used our our custom diffuser in the lower DRL portion along with switchback functionality. The housing was painted in satin black main trim, flat black reflectors and color matched shroud. 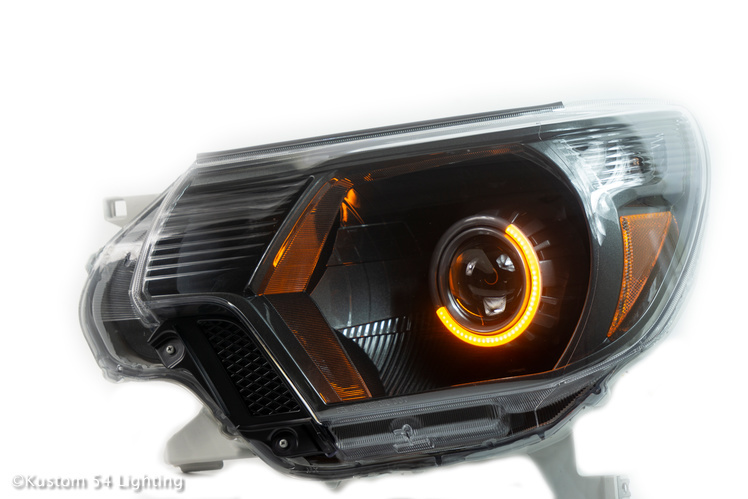 This EvoX retrofit received our upgraded Morimoto EvoX-R upgraded projector along with passive red demon eyes eyes. The entire housing was painted satin black and was retrofitted with our switchback moon halos for function and show. This set going out the door was painted in a gloss black paint job and had RGB demon eyes added to the factory projectors for show. 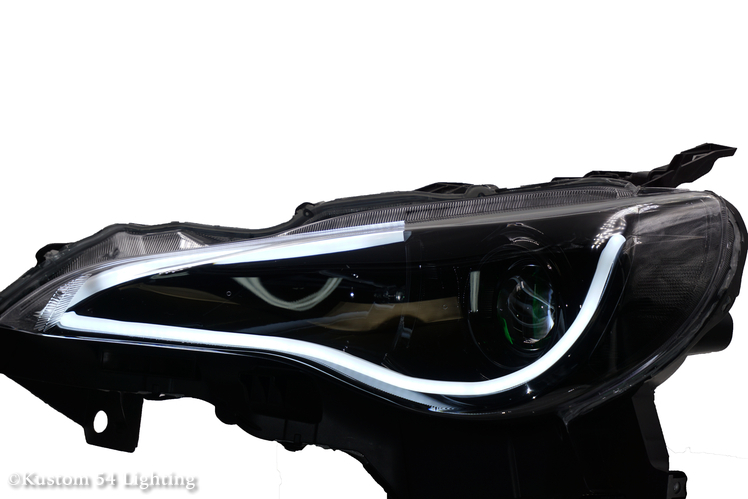 We also added an LED DRL switchback strip to function as DRL and also a blinker. This 4Runner retrofit came with our upgraded and tuned IS250 bixenon projector with a satin black and gloss black paint job and custom painted TRD logo reflectors. 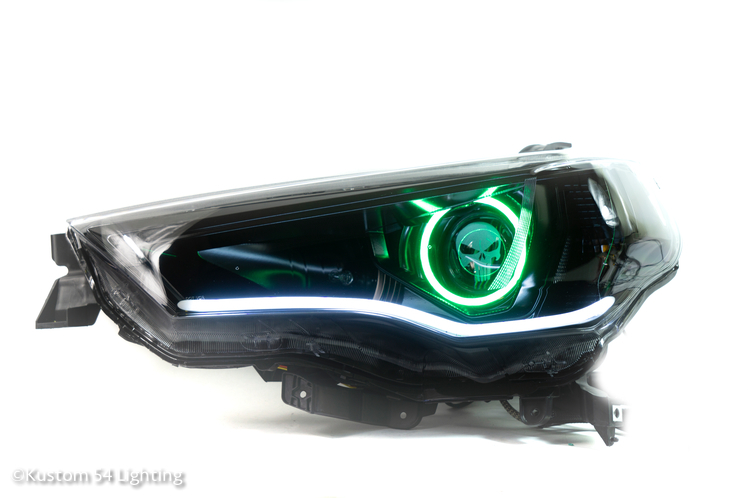 We also added a switchback halo and color changing demon eyes. 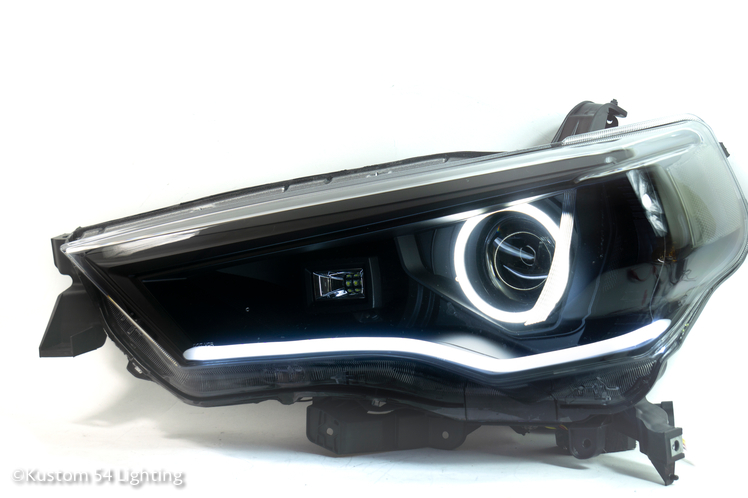 This amazing set of lights is full of goodies starting with RX350 bixenon retrofit paired with a Morimoto H1 bixenon projector for quad projector output. Both projectors got our color changing demon eyes and switchback halos. The entire set was blacked out and paired with a smoked clear reflector.